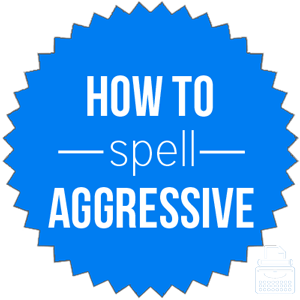 Spelling of Aggressive: Aggressive is spelled a-g-g-r-e-s-s-i-v-e. Definition of Aggressive: Aggressive describes someone or something that exhibits aggression, or physical violence. It may also describe one who is marked by obtrusive energy and self-assertiveness. Aggressive also describes anyone or anything that is strong or emphatic in effect or intent, that grows, develops, or spreads rapidly, or that is more severe, intensive, or comprehensive than usual in dosage or extent. Pronunciation of Aggressive: Aggressive is pronounced a-gress-iv. In this case, the “-e” on the end does not make the “i” long. What does aggressive mean? Aggressive is an adjective. It describes anyone or anything that is either physically violent, verbally abusive, or stronger, more intense, or more severe than usual or than necessary. Aggressive is used to describe human behavior and actions, as well as types of medical treatment, approaches to sales and other forms of persuasion, as well as human and animal personalities, and other inanimate things like colors and flavors. The inmate was sent to solitary confinement as he was aggressive and considered a risk to other inmates. She felt pressured by the aggressive salesman to purchase the car. They would need to use an aggressive form of chemotherapy to treat the aggressive bone tumor. When someone or something acts or does something in an aggressive way, the adverb aggressively is used. It is formed by adding “-ly” to the end of aggressive. Though it was just a class debate, the student argued his point aggressively. When he feels threatened by other males, the dog may act aggressively or even attack another dog. Aggressive was first used in the year 1716, according to Merriam-Webster’s. There are several synonyms for aggressive, but it is important to select the word that is most similar to the specific context or meaning. Aggressive is an adjective that describes people or things as being overly forceful, violent, eager to fight, strong, intense or more severe than is normal, expected, or necessary.